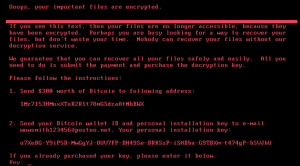 Petya Ransomware Affecting Critical Systems Globally: Here’s What to Do. Updated 3:19PM Pacific Time: A method to ‘vaccinate’ yourself against this ransomware variant has been found. I have posted details towards the end of the post along with a batch file you can run. It is as simple as creating the file C:\Windows\perfc and marking it read-only. Update 2 at 7pm PST on Tuesday: It appears that the initial infection many have come from a company called MeDoc that was breached. Their systems were infected and they then pushed out an update, spreading the infection. MeDoc are disputing the allegation. Sources: Talos quoted on ZDNet, Forbes and FireEye. This is a public service announcement from Wordfence due to the widespread and severe nature of this attack. A major ransomware attack targeting Microsoft Windows systems is affecting companies and systems, many of them critical, on a global scale. The ransomware has been dubbed “Petya.” It likely spreads by using two separate exploits. You don’t need to click on anything or take any action. This can spread into your system through the network. That is why it is having such a wide impact and why it is important that you update your system to protect yourself. For the technically minded: This ransomware is exploiting a vulnerability in Microsoft Office when handling RTF documents (CVE-2017-0199). It also exploits a vulnerability in SMBv1 which is the Microsoft file-sharing protocol. This second vulnerability is described in Microsoft security bulletin MS17-010. If you have not done so already, you should immediately install the MS17-010 patch from Microsoft. If you currently run an unpatched Windows system, you may not have time to patch it before you are infected. Consider shutting down your machine, if feasible, and leaving it off the network until there is consensus in the research community on what this exploits and how to protect against it. If you are technically able to, we recommend you block network access to port 445 on your Windows workstations. You may also want to monitor traffic to that port if you are a security professional. Keep an eye on the Microsoft Security Response Center where they will hopefully release formal guidance soon. Update your anti-virus definitions and run a scan on your system. You can find out which anti-virus products are detecting the current variant of Petya on this VirusTotal page. I’ve linked to one of the files involved in the infection. The page shows which AV vendors are currently detecting this file. The green check marks mean the file is not detected by that AV vendor (it’s counterintuitive). A Ukrainian state power company and Kiev’s main airport were among the first to report issues. The Chernobyl nuclear power plant has had to monitor radiation levels manually after they were forced to shut down the Windows systems that their sensors had been using. Antonov aircraft has reported being affected. Copenhagen-based shipping company Maersk is experiencing outages in multiple IT systems and across multiple business units. Food giant Modelez, which makes Oreo and Toblerone, has also been hit. Netherlands-based shipping company TNT was also hit. French construction company St. Gobain has been affected. Pharmaceutical company Merck says they have systems affected. Law firm DLA Piper was hit. Heritage Valley Health System, a US hospital operator, has also been hit. Kiev’s metro system has stopped accepting payment cards because they were affected. The list is long and growing; the above just a snapshot. Many are reporting the belief that the South Korean hosting company that paid attackers a $1M ransom a week ago to recover their data have created a huge incentive for future ransomware attacks. That has resulted in this new spate of attacks affecting systems globally. Symantec analysts have confirmed Petya is similar to WannaCry. The BBC is providing excellent coverage. Catalin Cimpanu is, as usual, providing excellent coverage. He is reporting that Posteo, the email provider where Petya’s author is hosting an inbox to handle ransom responses, has just shut down that inbox. That means that if you have been hit, you can no longer contact the ransomware author to pay the ransom and your data may be permanently lost. Dan Goodin over at Ars Technica is also covering the story. Info is emerging in real-time on Twitter from security researchers. Thanks to TruStar for providing additional analysis. 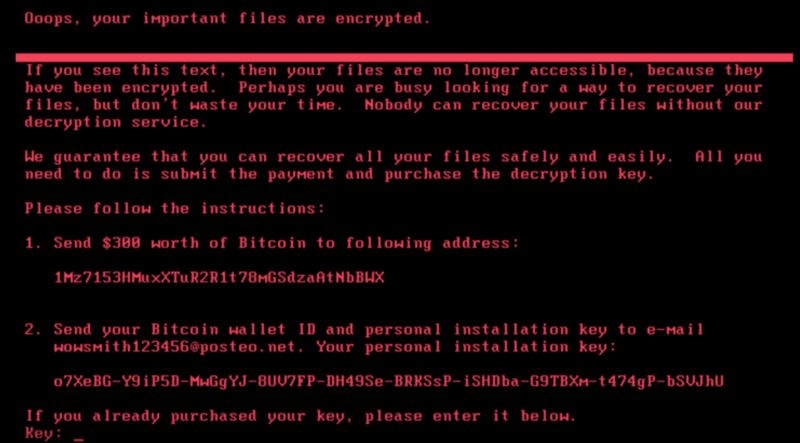 In the past couple of hours researchers have found a ‘vaccine’ against having your files encrypted by this new variant of Petya. They discovered that if a file exists, the encryption routine will not run. Amit Serper who found this had their findings confirmed by other security researchers. This post in BleepingComputer also includes instructions on how to create the file manually if you would prefer to do that. Once this file is created, the encryption routine for this specific ransomware variant will not run and encrypt your files.